And accept it as this? The answer lies not with the trout’s vision, but with his perception; that is, how the trout’s brain registers the sensory input of vision and matches it to an established pattern. As fly fishermen we have for centuries looked at the thick hackle of a standard upright dry fly and assumed that the trout sees the hundreds of light points breaking the surface as the six legs of a mayfly. That astounds me! A fish with such fine vision will see all the hundreds of those discrete hackle points. However, while the trout can see the difference between six sparkling points and hundreds, the trout can’t discern or perceive the difference. Vision is the portal for raw sensory information. That information is so complete, and flowing at such a rate, as to be overwhelming. No animal could survive if each day it had to relearn, moment-by-moment that certain images represented danger and others, food. So, cognitive systems, both machine and organic, use pattern-matching. “Pattern-matching” is the act of checking for the presence of all the elements of a given pattern. As humans we unconsciously learn pattern-matching at an early age. Since we humans serve as both predator and prey, our brains need to be able to alert us to danger, or food, quickly. This cannot be a conscious process as that would be far too slow; thus, the pattern-matching. When my vision sends images of, for example, a three-legged chair, to the brain, the brain temporarily records the input, while trying to create an object from all the associated parts. This becomes the gestalt – an organized whole that is perceived as a whole – rather than a collection of discrete elements. Having established a gestalt, an apprehension of an object, the brain must now match it against familiar patterns that indicate danger, in order to send a fight or flight warning. The chair is quickly noted as not matching the shape of a known threat, nor as food. The brain next performs a lower level of mapping which covers more databases as it were. (It is known that humans have a database for tools and common objects – the first database that starts to fail us with age. Sigh.) Eventually – in real time it may be thousandths of a second – the object is perceived as a chair. Important note, it is perceived as a chair, it is not seen as a chair. The trouts, fellow predator and prey species with humans, also use pattern-matching for quick identification of danger and food. This mechanism has been proven to be active in other fish as well as many insects. Next, check for food. Is the object a food item? “Yes”, “No”, or “Maybe”. And that is the crux of it. If as anglers we can establish “Maybe” we have won the first part of the game. “Maybe” can indicate insufficient information which may lead to further investigation through other trout senses – Taste and Touch. In order for the fish to touch and taste, he takes an object in his mouth, hands being in short supply. This is why we set the hook on a rise, for we know that the trout will reject our fly as soon as it fails the taste/touch test. 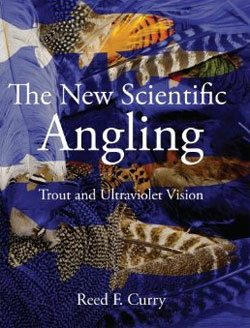 In short, we have not fooled any of the trout’s senses; we have, however, baffled the visual pattern-matching. And if that trout is released or gets free, it has a new template to add to the database of known dangers – a #14 Quill Gordon. As fly fishermen we learn that during a steady hatch of flies, trout will not take every natural fly that drifts within reach. Some they may follow before taking, others they ignore altogether. This is because the food is flowing in such abundance that the trout can afford to take those that match most accurately one particular pattern. One instance of this would be when two hatches are occurring simultaneously, a small mayfly and a large mayfly. If the small mayfly started hatching first, the trout would already have established a perceptual pattern-matching that worked for that fly. Therefore, and perhaps we have all seen this, the trout continue to take the small flies and ignore the larger flies. As humans this seems illogical, there is a greater reward of protein and fat in the larger flies for the same amount of effort. Sipping the smaller flies is inefficient. However, let’s look at it from the perspective of a fellow predator/prey species – the safe known is always preferred to the unknown. In case any reader thinks the previous paragraphs have been attributing some form of logical thinking to trout – clever little beasties – that is not the case. Cleverness and rational thinking are not synonymous; a moment’s observation of CSPAN proves this. To be clever is to be “adept at seizing” from which the word is derived. A trout that is not adept at seizing food when it presents itself is a very thin trout. Pattern-matching is not a conscious thought process. It is a simple, spontaneous, database query, or series of queries, of which the trout – or man – is largely unaware. For example, when you see the word “food” you are pattern-matching. Your vision provides the input of the separate symbols of the letters, but your perception of the letters is a pattern. This required no conscious thought from you. You did not consciously decide to understand the discrete symbols (letters) as a single pattern, in fact you had no control over it. Further, you would have perceived the same matched pattern in many different fonts, despite the visual dissimilarities. You will use the same pattern for Food Food Food Food Food and Food. For the trout, the outcome or result of the pattern-matching is a “Yes”, “No”, or “Maybe” that provokes action. “Yes” has the trout take the fly, “No” has the trout reject the fly, and “Maybe” provides different responses for each fish or species. A brook trout, which as a species are opportunistic feeders, will probably respond to “Maybe” by taking the fly in its mouth for further testing. Some large brown and rainbow trout on a quiet stream might drift behind the fly for some time, for more visual sensory input on a “Maybe”; while other trout in faster water might immediately perform the taste/touch test. Now let us speculate about the elements or parts of a pattern that would be essential to the trout in order for the fish to perceive a floating mayfly as potential food. This would be the trout’s pattern – the term “template” is also apt – of a mayfly, without which the fish could not safely feed. The trout’s gestalt would be the complete image of the floating object as received from the senses. The pattern-matching would be application of the gestalt against one or more patterns. What works in our favor is that the patterns that the trout have for mayflies, caddis flies, etc. are necessarily vague. In order to understand how complex pattern-matching is for the trout, we can observe the stream after a hatch of mayflies. Some of the flies we see will have no wings emerging, they are still stuck in the nymphal case; others will have broken or bent wings; some will have malformed wings; some will be tipped on their sides; some will be floating drowned; and some will be spinners with wings outstretched. The trout’s pattern for mayfly wings, therefore, must be quite vague, perhaps simply a small extension from the body, light in color and displaying a touch of UVR. A trout that only eats mayflies with perfectly formed wings is missing a lot of food. The same applies to tails. A mayfly may have either two or three tails. That is the perfect insect under perfect conditions. However, to optimize feeding opportunities and still retain a measure of safety, the trout brain probably reduces mayfly tails to the lowest common denominator of one bent blur. Let’s look at an example and see how generalized it might be. Here is a view of a mayfly from beneath set in grayscale. I used grayscale because any master pattern for mayflies in general must accommodate many colors. Now, we can’t have that many legs or tails as these may be missing so we generalize a bit more by removing two tails and all legs. However, as the segmentation of the body is still clear, we need to blur things a bit in order to allow for differing lengths of segments. That is pretty general. It would even match very well the gestalt of a No-Hackle pattern as seen from below. However, the above, besides being pure speculation, represents just one of hundreds of patterns a trout would have for a generic mayfly. Why hundreds of patterns for a generic fly? Because the fly could be viewed from hundreds of angles – front-on, directly underneath but tipped to one side or another, end-on, etc. Below is a directly side-on, or a mayfly lying on its side on the water. I have removed the legs and reduced the tails from three to one. Now I need to generalize it to allow for crumpled wings, broken tails, and differing lengths of segments. In the following list of possible mayfly pattern elements we are assuming that no hatch is occurring and the fly is drifting freely; therefore, matching a given fly size and color is not a consideration. 1. Body – The visual sensation should indicate a body, as that is pronounced in a mayfly and provides the greatest caloric offering. 2. Wings – These might or might not exist depending on the state of the emergence, how the fly is aligned, malformed wings, etc. A short post in moderate to high UVR would probably provide enough. 3. Outline – The mayfly outline both from below and from the side is widest near the front, in the thorax. From there it tapers to the tails. An artificial with hackle fore and aft, like the Buzz Hackle, would not present this piece of the pattern. The average twig doesn’t, either. 4. Translucence – Many mayfly duns and spinners have translucent bodies. 5. Color – There is no one color that fits as a pattern element; however, there are certainly colors that do not fit, blaze orange for instance. 6. 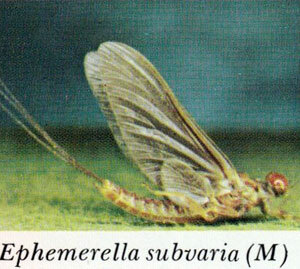 UVR – Some UVR should be expected from any of the mayflies, however the entire fly would not give a consistent UVR. A twig, on the other hand, might give a consistent UVR. 7. Texture – The surface of the mayfly will not be perfectly smooth. 8. 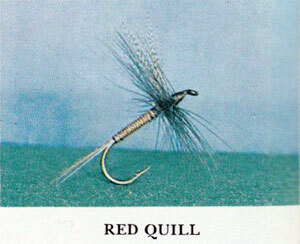 Action – Only certain movements would conform to the trout’s pattern of most mayfly duns and spinners. In most cases no motion, other than that produced by wind and current, would be correct. Caddis flies would differ, of course. There are doubtless other elements to a large trout’s general mayfly pattern-matching. Each trout would have a unique set of patterns, built through its lifetime exposure to natural mayflies. It is entirely likely that some essential patterns of food sources are passed through genetics as well. After all, trout fry have no parent present to instruct them on the edibility of plankton, nor to transition them to insects when plankton no longer satisfies. As a hatch is progressing, it is likely that the trout is modifying its base pattern to include the parameters of size and color. The new pattern, through its greater number of elements, increases feeding safety and speed. Thus the trout sips only the small sulphurs which have no trailing shuck while ignoring the larger flies that are hatching simultaneously. The gestalt of the floating fly is going to differ moment-by-moment. Imagine the number of possible views of the fly as it is drifting on the current, perhaps side-on, or spinning slowly in an eddy; and the complexity of the instantaneous pattern-matching required by the trout’s brain becomes awe-inspiring. For example, look at your left hand held flat in front of you – you immediately recognize it as a hand. Now, rotate it slowly and observe the different perspectives. In each degree of rotation on each axis the hand has a different appearance; yet your brain still recognizes it as a hand. The trout is going through the same process every time it observes a potential food item above it. As the floating fly turns, a new gestalt is formed and the trout’s brain must apply a fresh pattern against the new gestalt. An utterly unconscious act, yet absolutely amazing! Remember – all that trout’s superb vision simply builds a database query. If the query doesn’t return a “Yes”, a “Maybe” may be just as good.